In the latest incident some 2000 non-white youths comprising men and women but primarily men, assembled on South Street in Philadelphia and preceded to attack passer-by’s at random, it is notable here however that in the main the objects of the mobs rage were whites, one victim recounts an attack. “At 11:30 p.m. March 20, he and his girlfriend were eating with a married couple at Bliss restaurant on South Broad Street, whose front windows open onto the street. Suddenly, a "totally normal looking" black teenager hit the man's friend on the head three times, and then ran off. The man followed, but soon gave up. As he returned to the restaurant, he heard other African American teens taunt him, saying, "What's the matter, white boy, you scared?" and "All the white people are scared" as they laughed”. Yet as usual there is a conspiracy to lie, to present the obvious as something else, rather than an attack with racial overtones such incidents are merely mindless violence or as stated in this case, merely random, yet it is exactly the reinforcement of such behaviours that will or could lead to more savage attacks upon whites and the vulnerable as we are seeing in South Africa. Across the world attacks upon whites are increasing and the owned media and the liberal elites simply stand by, waiting to pounce upon those whites who either respond in kind or endeavour to do so. Multiculturalism does not work, cannot work, all it does is intensify dislike, grow hatred and lead to misery, is it not about time that the media presented fact, voiced truth and helped defend the law-abiding and the innocent, whomever they be. 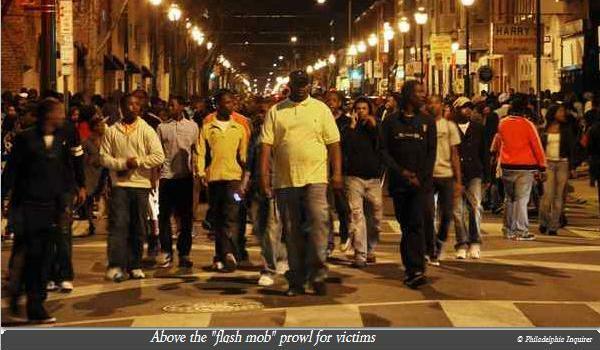 Stu Bykofsky: Most flash-mobbers were black, but was the incident racial? 0 Responses to "Anti-white attacks"